But wealthy investors do not commit a major portion of their investable assets to real estate, according to the Spectrem study Asset Allocation, Portfolios and Perceptions of Providers, which examines the details of the average portfolio for wealthy investors ranging in net worth from $100,000 to $25 million. A quick examination of the averages show where the value of real estate lies in the minds of wealthy investors. Among all investors, 66 percent total assets are investable assets, while only 6 percent is listed under “investable real estate”. That percentage is standard among all investors no matter their age, wealth level or employment status. 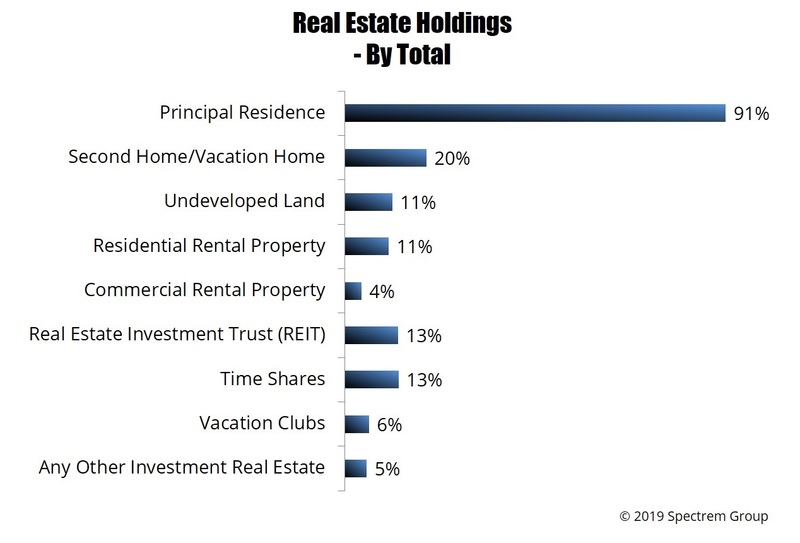 Among real estate holdings, 91 percent of investors own a principal residence, and 20 percent own a second or vacation home. Those are relative standard real estate investments. As expected, as wealth increases, ownership of a second or vacation home increases, reaching 40 percent of investors with a net worth between $15 million to $25 million. There is a similar increase in the value of those second homes as well. But 13 percent also own shares in a real estate investment trust (REIT), and the average amount invested in REITs is $88,000. Fewer investors invest in undeveloped land (11 percent) or residential rental property (11 percent) but those invested in such properties are more heavily invested. The average investment in undeveloped land is $211,000 and the average investment in residential rental properties is $492,000. The study also shows that 3 percent of wealthy investors own time shares, and 6 percent have membership in a vacation club. Real Estate investment is usually designed to be a long-term proposition. The value usually increases slowly over time but it is not a market that suffers much from current events or political maneuvers. While housing is a fluctuating market, real estate is not.